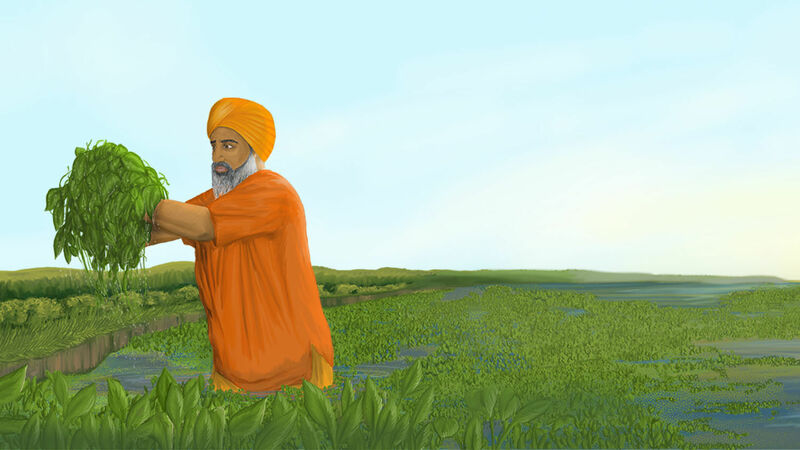 “It had become a dead river,” said Sant Balbir Singh Seechewal in a January 13 interview with the Trumpet. He was describing the Kali Bein River in India’s Punjab region. Historically, this 99-mile-long tributary of the Beas River had been beautiful, full of life, and coursing with clear water. It had long been considered the lifeline of central Punjab’s Doaba region, where Mr. Seechewal grew up. But beginning around 1960, the combination of population growth and industrialization in Doaba took a heavy toll on the river. Six towns and some 40 villages discharged their sewage and industrial waste into it, and long stretches were reduced to a sludge of thick and toxic filth. Some parts were dried up all together. The people living near the river were suffering as a result. “A foul smell came out of it,” Seechewal said, adding that “nobody wanted to pass by the river.” Neighboring farms were enduring severe water shortages. Upstream regions experienced debilitating water logging since the river was no longer draining those lands. And the infected effluents, including poisonous chemical waste, were seeping into groundwater reservoirs and causing lethal diseases such as cancer among the Punjab people. That was the situation in the year 2000 when Seechewal set his sights on the fetid mess that had once been the abundant Kali Bein. Seechewal envisioned the river in its former glory, sparkling and bountiful. He longed to see it restored to that state. After failing to convince government and municipal bodies to take action, 38-year-old Seechewal decided he would devote his time to rejuvenating the river—personally. Seechewal began traveling up and down the Kali Bein, visiting the towns and villages that were suffering from the polluted river—and were polluting it. He spoke with any who would listen about the need to revive it and sharing his vision of a clean Kali Bein. His basic message was: If we work on this together, our river can be beautiful, abundant and vibrant once again. Some individuals responded to the message right away. People from several villages volunteered to help Seechewal and started raising money to buy sickles, shovels, spades and other tools and cleaning equipment. In a short time, he and these volunteers were down in the mud and muck, hard at work. The team was small and the scale of the project was colossal. But Seechewal was not discouraged. “Undeterred by the mammoth task ahead, with his bare hands he started pulling out the weeds and clearing the garbage from the slushy riverbed,” journalist Narendra Kaushik wrote in the Weekend Leader (Aug. 1, 2016). More and more people started offering their labor to the project. After some farmers brought their tractors to the cleaning sites, progress shifted into a higher gear. And Seechewal was always on the front lines. “Seechewal himself was on the field either driving the tractor, supervising or getting down [in] the dirty waters,” Kaushik wrote. As the years went by, more and more individuals saw the progress and volunteered to help Seechewal. Eventually, thousands of people from more than two dozen villages were assisting in the great cleanup. As they cleared a given section of riverbed, natural springs revived. The water rose, filling the riverbanks. And their work didn’t stop with cleaning the riverbed. Seechewal’s teams also built embankments and brick sidewalks beside long stretches of the Kali Bein. They built numerous ghats—stairways for access to the river—and planted fruit trees and flowering plants along the banks. “Today, the Kali Bein is thriving,” Time wrote in 2008, as it conferred the “Hero of the Environment” award on Seechewal. But the challenge was not over. Some of the locals living along the Kali Bein continued dumping waste and trash into the cleaned river. Knowing that all of their hard work would be undone if the pollution continued, Seechewal again petitioned the government, asking leaders to take action against the practice. But again his requests were ignored. Seechewal’s low-cost, natural system treats sewage water in a way that makes the recycled water usable for irrigation and agriculture, so farmers also benefited from the process. After his team formulated this plan, the Punjab government finally got behind the initiative and helped make it a region-wide reality. In 2017, in recognition of Mr. Seechewal’s remarkable accomplishments, the Indian government conferred upon him the prestigious Padma Shri civilian award. The government has also asked Seechewal to apply his proven model of community-based river restoration to the mighty River Ganges. “We have proved that it is possible to restore our rivers to a pristine condition if we all come together,” Seechewal told Time, adding, “It is time to do that on a bigger scale” (Sept. 24, 2008). Mr. Armstrong also wrote about a future cleansing of this pollution that will happen on a far “bigger scale” than what Seechewal envisioned and achieved. In his booklet The Wonderful World Tomorrow—What It Will Be Like, Mr. Armstrong made clear that the problem will be solved globally, and the entire world will be a pristine utopia. But, he explained, it will only happen after human nature—short-sighted, self-serving and law-despising—is fundamentally changed. Mr. Armstrong made clear that the Creator God did not “create within humanity this thing we call human nature.” Instead, the kind of self-serving nature that results in environmental devastation and all other evils is something that people acquire as a result of rebelling against God, and yielding to the corrosive influence of Satan the devil. Mr. Armstrong explained that when Christ returns, He will bind and lock up the arch-deceiver. “No longer will Satan … be able to inject into unsuspecting humans his satanic nature—which we have been misled into calling ‘human nature,’” he wrote. Christ and His saints will then undertake a global “process of reeducation—of opening deceived minds—of undeceiving minds, and bringing them to a voluntary repentance,” he wrote. Jesus Christ will return to Earth and bring with Him true education, teaching all mankind to love God’s law. God’s power will change human nature! Jesus Christ, he wrote, is “coming in all the power and glory of Almighty God, as ‘King of kings and Lord of lords’ (Revelation 19:11-21), to … establish God’s world-ruling government over all nations,” he wrote. He then cited numerous Bible passages foretelling of this momentous event: Daniel 2:44; 7:9, 13-14, 18, 22, 27; Isaiah 9:7. Isaiah 11 and 35 describe the worldwide beauty and abundance that will result from this reeducation of mankind. “He will enforce God’s law—God’s government on Earth,” Mr. Armstrong wrote. As a result of people abiding by that law and living and working under that divine government, “Air pollution, water pollution, soil pollution [will be] gone” and all people will have “[c]rystal-pure water to drink” and “clean, crisp, pure air to breathe,” he wrote. Seeing Mr. Seechewal’s success with the Kali Bein can help us to envision that “fabulous picture” of the entire future world, when people will live joyous lives on an Earth that is clean, beautiful and abundant. It can help us picture the time after human nature is changed into God’s nature, and radiant utopia will cover the Earth.